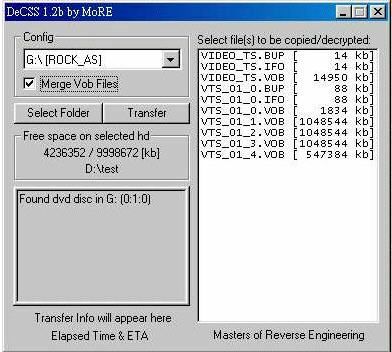 When copying VOB files to the hard disk, due to CSS protection, generally the copied movies can not be played on the player and become the noisy sound, even more serious, the movies are not allowed to copy to the hard disk, namely, the instructions are not implemented While now, the protection has been cracked. If you still do not learn about it, you must know about it, as this is the basic concept. This step is easy if you have read the instruction. It does not matter if containing too many files on DVD. We can merge them into a single one. Why do we still merge the files into a single one since it is too big to put in the disc? You know, the capability of the disc is about 640 MB, and even though you divide *.vob with 1GB capability into two parts with ripping tool, it still takes up too much space. Only merge all of the VOB files into a VOB file, we can save disc space and avoid missing *.vob files. Right? DeCSS has already provided the function to merge *.vob files altogether into a file. Pay attention: choose the first 1 GB file as the starting to the final one and remember to exclude the unwanted ones and tick the ?merge? option. Then it will be done! 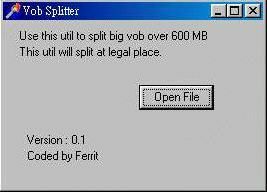 It should be noted that Vob Splitte will take some time to cut VOB file and will retain the original large VOB file. If we deal with a 4 GB *.vob file, it must take up 8 GB space of hard drive. It is not recommended at this time to go to the implementation of other actions in case that the ripped *.vob files are out of sync. These are some skills purely and can not be used in the illegal piracy!